The rest of the below assumes you are on your or someone else’s branch with the changes you want to push upstream. Rebasing will not automatically close the pull request however, if there is one, so don’t forget to do this. Merging will automaticall close the pull request on github. shows the log of commits excluding those that can be reached from upstream-rw/master, and including those that can be reached from current HEAD. That is, those changes unique to this branch versus upstream-rw/master. See Pydagogue for more on using dots with log and also for using dots with diff. And that’s all. This commit is now applied as a new commit in master. 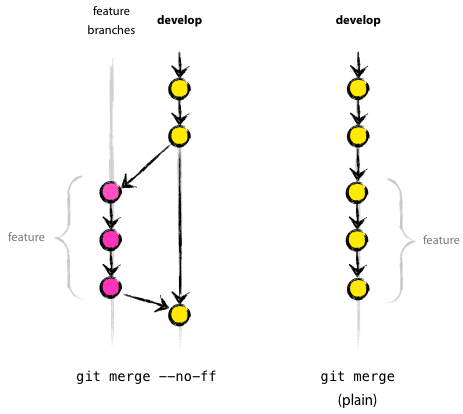 By default, git merge is a fast-forward merge. What does this mean, and when do you want to avoid this? Any bug fixes and maintenance commits intended for the next micro release should be made against master as usual, but tagged with the milestone for the micro release it is intended for. Then merge into master as usual. When ready to do the backports, use the file tools/backport_pr.py to identify which PRs need to be backported and to apply them to the maintenance branch. The tag for the release should be made in the maintenance branch. Go back to setup.py and set isreleased = False and bump the major version in master. Update the version numbers in the statsmodels/statsmodels-website repo. These are in conf.py. Also upload the released version docs to stable/, move stable/ to a placeholder for older version documentation. CMP: Compiled code issues, regenerating C code with Cython, etc. TST: Change to a test, adding a test. Only used if not directly related to a bug.